Twenty-seven Grade 7 students from Britannia Elementary School are finding creative ways to be leaders and speak their minds this week, culminating in a public showcase this Thursday evening at 6:30 pm. All are welcome. Their inspiration is 'The Gift', by John Aitken and Gail Noonan. 'The Gift' is a self-narrative of dancing and drumming about Salish youth, John Aitken, who did not speak for the first 18 years of his life, and sought out the transformative healing of the arts. 'The Gift', a movement based play with very little text, digs deep into the issues of acceptance, of overcoming adversity and of having the courage to speak, sing and dance. In this week-long program by DAREarts, running from Friday, January 20, to Thursday, January 26, the young teens are exploring their own real life challenges and triumphs inspired by the content of 'The Gift' as they engage in visual arts, writing, music, dance, drama, videography and media arts. They are 'DARE-ing' to move from a state of voicelessness to a place where they acknowledge and celebrate their own gifts, creating a powerful bridge of hope between hurt and healing, silence and song. "Through these artistic mediums, the children explore ways that the DARE values of Discipline, Action, Responsibility and Excellence can guide them through challenging times to become leaders," says Shelley MacDonald, DAREarts Vancouver Lead Teacher. "The children create artwork and performance pieces that speak for them of their self-exploration of these life values." Their value-inspired Artistic Showcase and celebration will take place in the Auditorium at Britannia Secondary School on Thursday, January 26, 2017 at 6:30 pm. The media are invited to share in this incredible experience. DAREarts (Canadian Charitable No. 88691 7764 RR0002) provides unique, values-based arts programs for 9-19 year olds in urban and rural areas across Canada, including Indigenous communities. The children explore personal values and identity while they paint, sculpt, sing, dance, compose, design, write, act and create, guided by arts professionals. DAREarts provides much-needed opportunities for children to discover how to express themselves in positive and creative ways. In its 21st year, DAREarts has influenced more than 200,000 children across Canada! Lead supporters are Northbridge Insurance, Scotiabank and TD Bank Group. 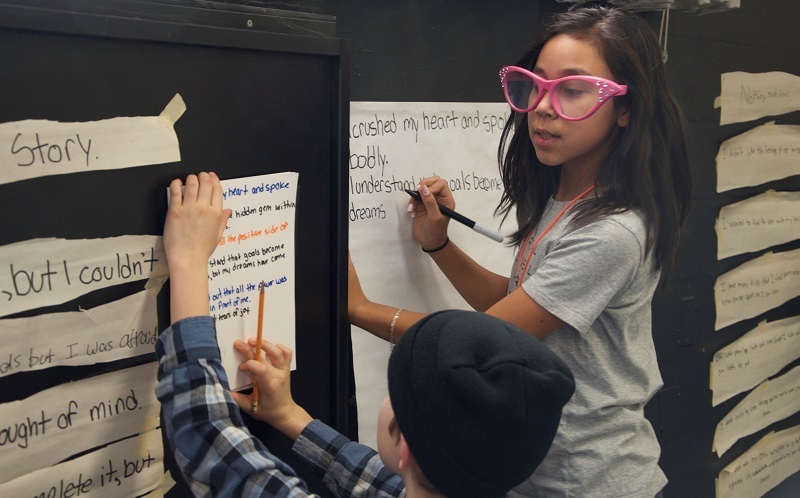 The DAREarts Vancouver program has been generously supported by ArtStarts in Schools, a charitable organization that promotes art and creativity among British Columbia's young people, and by Parker Art Salon. Special thanks to Presentation House, Opus Art Supplies and Britannia Elementary and Secondary Schools. For more information, please visit www.darearts.com. Youths prepare their collective creative voice for Thursday. 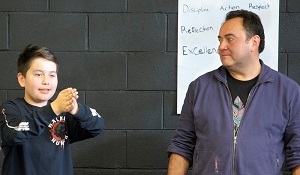 Artist John Aitken inspires youth to speak through their own creativity.